After being together for almost 2 decades, these two New Zealand love birds were not going to let a little bit of Las Vegas rain put a damper on their day! I am so happy to have met these two beautiful people. Not only are Shayla and Paul two amazingly generous and kind people, they are also amazing parents and friends. These guys planned to travel to Las Vegas for a low key elopement with their two children. Little did they realize that they're group of closest friends were not going to miss out on witnessing their marriage. So, the whole group of 17 made their way to the other side of the world to be together because that's what friends do. They stick by each other through thick and thin. I'd say Shayla and Paul are so lucky to have such good friends, but I don't think luck had anything to do with it ;) We met up with the group on a cloudy and drizzly Monday afternoon. As soon as Angie of Peachy Keen Unions began their beautiful ceremony, the rain let up and allowed everyone to enjoy and be present during such a special moment. After the ceremony the group hopped on to their limo bus and we made our way to the famous Welcome to Las Vegas sign for the obligatory group shot. 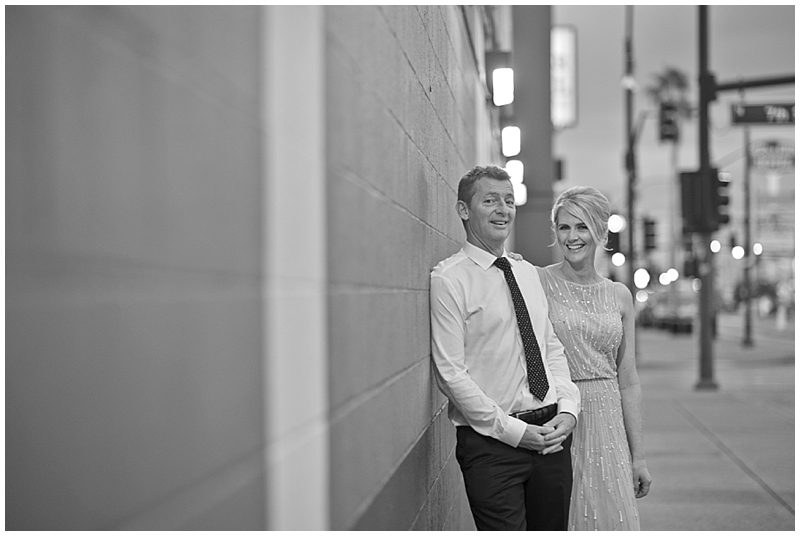 Then, we took to the streets of downtown Vegas to capture a few more fun shots of the newlyweds, along with their children. Like I said, no amount of rain was going to stop these guys from having the best day ever! I love that you can just see their happiness exude through these photographs. They deserve all the happiness in the world! We had a blast getting to know them and documenting a bit of the beginning of the next chapter in their lives as Mr. & Mrs.